THE BLEACHER BRIEFINGS: Chaos in Orlando: What's the Deal With Howard and the Magic? Chaos in Orlando: What's the Deal With Howard and the Magic? 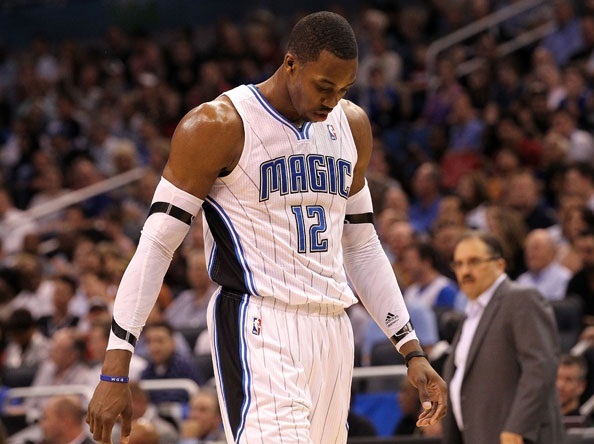 It was announced yesterday that Orlando Magic star center Dwight Howard would miss the remainder of the season due to a back injury. However, if reports from the previous day were true, injury or not, Howard had no intentions of playing for the Magic again this season regardless. Not if head coach Stan Van Gundy was still there anyway. According to WKMG news in Orlando, Howard called team owner Rich DeVos on April 13th and told him he wouldn't play for Van Gundy again. To make matters worse, the call was supposedly made during the Magic's 109-81 loss to the Atlanta Hawks. Of course, Howard's representatives deny the phone call ever took place. "It's a completely made-up, B.S. story," one source told ESPN. All this comes about a month after Howard set off mini-celebrations in Orlando by agreeing to stay with the team for the 2012-13 season, and only a couple of weeks after Van Gundy, in a scene with no NBA precedent, stated publicly he has long known that Howard wants him fired. Look, it's no secret that these two don't particularly care for one another, and I'm sure Howard is still ill that his coach publicly threw him under the bus a few weeks ago. But quite frankly, he deserved it. Uncertainty has hung over the organization for quite some time. Howard asked management for a trade in the preseason, but after months of speculation, he signed a waiver of the opt-out clause in his contract, meaning he would remain with the Magic at least through next season. Why did he do this? In my opinion, it was to avoid looking like the second-coming of LeBron James. Howard's not stupid. He saw how basketball fans turned on LeBron after he bolted from Cleveland, and Howard didn't want to be seen in the same light. So, he figured the easiest way to avoid any negative criticism was to just remain in Orlando. Which would have worked, had he not sabotaged his own thinking by then asking for Van Gundy's head on a silver platter. Not that I necessarily believe Howard initiated the whole thing. DeVos knows what Howard means to his team and to the city of Orlando in general. My guess is, management approached Howard and asked him to name anything they could do to keep him long-term, and if dumping Van Gundy would help the cause. Gee, I wonder what Howard's reply was? Van Gundy obviously knows he's a lame duck coach. Knows management is going to side with Howard over him, because Howard's the money maker for the organization. The guy who puts people in the stands. So, if the coach can't win the fight, he might as well make the player look like a jerk as he's being shown the door. And while he hasn't been shown the door yet, mission accomplished. I don't agree with the politics of it, but you can't really blame the Magic for taking that sort of stance, considering Howard is the face of the franchise. Still, it's ridiculous that it's gotten to the point where players are the ones basically running the teams and calling the shots as to who stays and who goes. What would happen if you went to the owner of the company you work for and asked them to fire your manager? Unless the owner is an immediate relative, you're the one getting the pink slip. What makes all this even more laughable, is the fact that Howard hasn't earned the stripes to have this type of pull in the first place. Aside from a slam dunk contest, what exactly has he won? Still, we all know how this is going to end. There's no way these guys can coexist, so as soon as Orlando, playing without Howard, gets bounced in the opening round of the playoffs, Van Gundy will be on his way to the unemployment office. It may not be right, but it's the way things are. It's the world we currently live in. And oh, what a world it is. Both Howard and Van Gundy have handled this entire situation the wrong way. I agree that Howard hasn't earned the right to be calling for anyone's job though. Bush league move if that's what actually went down. I totally agree. Nice post Kris.